I have used this app on and off for many years and switched completely to it three years ago. I own the IOS and android version as well as the Windows app for editing. When I use my IPad for loops I use my android version. It’s a simple app and best of all I can do 2 columns. It much more reliable than other apps I’ve used. I play on average 2 weekends every month and haven’t had zero issues. I’m not sure why there’s negative reviews. One suggestion I have is perhaps making the Android and IOS version feel more identical. One last thing the developer is pretty good at responding when I had a license key issue. I used to love this app, but lately its doing some strange things. Like when I transpose a song and save it, it reverts back to the original key. There used to be a way to get support for the app, but that seems to have disappeared. I choose to use this app over OnSong for two reasons, 1. It will fit a song to the screen using columns, and 2. It let’s me save everything to Dropbox. There have been very minor glitches with updates, but I have found the developers to be very responsive to emails, and very quick to fix problems by issuing updates. My group tried a bunch of these type of programs and this is the best if what you want to do is to share songs, flip pages, transpose keys, and so on. If you also need to control lighting and such there are other programs that do more but for what it does this is the easiest to use and most reliable. We use it every day and now have over 100 songs in it. Sharing with Dropbox sync works quite well and is easy to set up. SongBook has full Mac and Windows versions available. Great for editing and loading songs for later use on the iPad or Android tablet. An important bonus is the excellent (and fast) technical support. The guy who runs this company is nice. Buy this program for managing and sharing songs. Highly recommended. I have used apps to manage setlists many times and I’ve never found one so difficult to figure out. As a matter of fact I still haven’t got a setlist setup. At one point I thought I did but couldn’t get it to scroll. Then when I went back to it the songs were listed but gone. And when I went back to the main list they were gone or contained the lyrics from the song above it in the list. I want my $11 back! It's never died during a gig. And the iOS version works. But there are so many goofy issues. In isolation not a big deal. But when you're trying to get things together for a show it can be frustrating. The desktop app is pretty awful and won't run or crashes. In short, this entire produce comes across as a little half-baked. But it's so much less than OnSong that I guess you could run with it. Just be prepared for little issues that aren't a big deal the first month but after 18 months get more and more annoying. This app used to be great, but now unexpectedly crashes in the middle of gigs. No bueno! I have bought this for virtually every platform that it is available and my song stuff seamlessly integrates across devices with Dropbox. So cool! Has 2 column support in landscape for less or in some cases no scrolling (OnSong still doesn’t despite 2+ years of promising it is coming soon). Price / features way cheaper than OnSong. Buy the PC version too if you use Songbook much because they compliment each other so well it is very worth it! We’ve tried a bunch of these type of programs and this is the best if what you want is to share songs, flip pages, transpose keys, and so on. There are other programs that do a lot more but for what it does this is the easiest to use and most reliable. 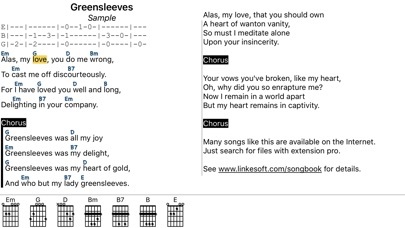 Unlike some of the others SongBook has full Mac and Windows versions available. 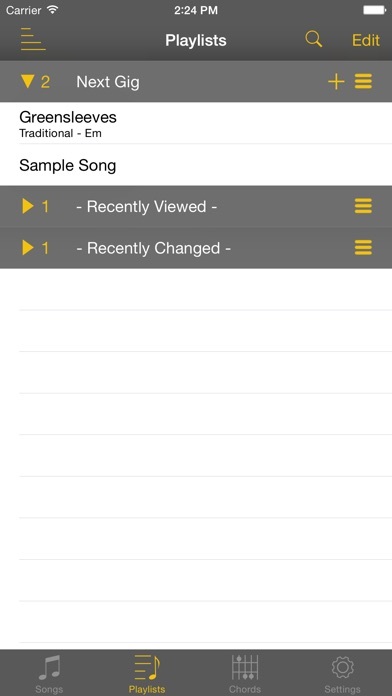 Great for editing and loading songs for later use on the iPad or Android tablet. Sharing with Dropbox sync works quite well and is easy to set up. An important bonus is the excellent (and fast) technical support. Check the feature list, make sure it does what you need. If so - buy this program. Highly recommended. I've tried most of the apps in this category, and SongBook is the one I chose to convert my catalog to. Here are my reasons: 1. It syncs with Dropbox (the killer feature, really) 2. It uses text files in a folder, and doesn't try making a separate database for the songs. Your mileage may vary, but that's what I wanted. 3. It has a Mac, iPad, and iPhone app-- all of which also sync with Dropbox, so I am never without my sheets 4. It uses standard ChordPro markup, so other people can participate even if they don't own SongBook 5. It auto-zooms when displaying a song. 6. It can display a song in multiple columns so I don't have to scroll while playing. (Though it can auto-scroll if you like that. 5. It exports to multiple formats-- though it cannot yet output a PDF in multiple columns, which is the primary missing feature for me. All in all, a great song chord sheet collecting and editing tool. Simple, not many bells and whistles, but all the right ones. This app is great by itself and works beautifully, until you try the play together feature. On 3 iPads on stage and couldn’t keep them connected during a show! This definitely killed the vibe for me and our Bluegrass group! Fix the Play together feature and this will be a hit! I love so much about this app, but i find that it crashes from time to time on my ipad 1 and my iphone 4s. Often at inconvenient times on stage. I'm also dying for a few new features... -An option to not have the file endings added automatically to the web searches. -it would be great If the import button showed up on lyrics sites as well as tab sites. I play a lot of songs that are very current and often not available As chord charts yet. I'd love to be able to quickly download the lyrics then add the chords myself. Also, It would be great if we could export song lists and playlists in a spreadsheet with titles and subtitles (artists) in separate columns so it's way to print into a request sheet. Other than that, great app! I've tried so many song book apps. This one is by far the easiest to use and the most consistent songbook program I have used. You can map the text files to any directory on your hard drive, you can edit them, add to them and not have to worry about the long precise naming used in other programs. The support team with this program was incredibly helpful and quick to answer any questions I had. You can edit with the CHORDPRO format then print out any SETLIST or song book in a nice, easily read, format, with chords above the lyrics, line by line. Save yourself weeks of aggravation trying to get the other programs to work, praying the formatting stays consistent or worse that your songs suddenly DISSAPPEAR because of a renaming mistype or secret file becoming corrupt. This program takes any song, in any directory (though songs must be in the same directory), any way you want to name them and your songs are always there where you put them. I love this app as I've used it for gigs, parties, you name it. I have over 500 songs and growing. Also with Dropbox it syncs seamlessly to other devices. But for one hitch, there's an inch high horizontal blank space on the bottom of the entire screen that serves no purpose. On a iPad mini it's a waste of screen space and makes usability difficult. Please correct that. Once done, I'll give five stars. My files won't sync through Dropbox. Songbook created a folder on my Dropbox but my charts will not appear in the app. iTunes shows that my charts are on the app but the app won't show them at all. TERRIBLE. I would like a refund because this app is useless. I'm sure if my charts appeared this review would be much better. I was beta tester for a while. The programmer included all my suggestions (and lots more). By now there simply is nothing missing anymore. Except maybe a decent counterpart for my Mac. Update: I just checked my old review and have to say that the program got even better. They managed to find and add even more useful features that I hadn't even thought of. I'd give 6 stars if I could. This app does import music but you need to convert files to plain text, no biggie. But! The files come across randomly messed up. Some import just fine but most import all jumbled and you have to physically manipulate everything by hand. Pain in the a*^!! If this was fixed I would recommend it, but in its current state, I spend more time fixing the poorly imported text files than actually playing music. This is my go-to app for keeping songs organized. I use Songbook to perform, playing guitar and singing. Input is easy for me, I get songs from Chordie or I input them by getting lyrics off the internet and I input chords manually. Ultimate Guitar website stopped allowing copying chord pro info in, a shame. I usually like to change chords... to my liking and this app allows editing content. I can set the font, size, scrolling and I can transpose easily. I like the new capability of numbering playlists. For our band it was important to be able to exchange songs within our remote group and with any platform in a non-proprietary format. I use this app now with five bands. I converted our bands list of songs into TXT files, and imported them to SongBook. From Songbook I could easily sync the files into a DropBox folder. Songbook simply places the raw files in Dropbox. We can have the TXT file in Songbook on iPad and that same TXT file shows up in the Songbook folder in DropBox. Nice thing about that is we can edit the songs from any location (iPad or PC) and the Songbook sync process updates to the latest version. There are no background conversions to proprietary formats. We wanted to be able to edit songs on iPad and have those same files available for to edit on PC. SongBook can do that. We tried several other apps and some convert imported songs to proprietary formats or databases making it hard to edit the files on different devices. 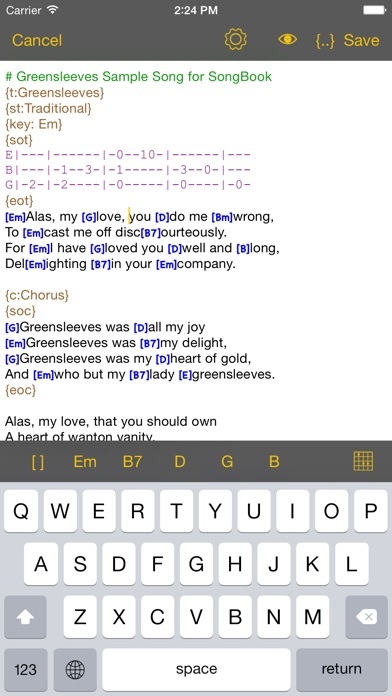 We also wanted to preserve the portability of the songs down the road, SongBook can do that. Really nice. The best app to store my favorite songs! I have already use it for 2 years and features progress is incredible! Thank you, guys! As a performing musician and a music therapist, this app is awesome for storing all of my music. I love that I can share charts with my bandmates by linking Dropbox and that I can search for chord sheets and tabs directly through the app. My ONLY complaint is that the app occasionally crashes when I am editing songs and it loses all of my work, which can be extremely frustrating. I really love this product. It uses the non-proprietary chordpro format that you can create/edit on any platform with a text editor if you like. Those files are tiny compared to PDFs so you can send them around or sync using dropbox in a flash and use very little of your storage quota. It runs on ALL major desktop and mobile platforms, and all are available for a very reasonable price. There are small feature differences, but you can absolutely share the same files across all of these platforms and it works great. This is very important for a large diverse group of folks, all with their favorite flavors of gadgets and with very different levels of technical knowledge. Now add that you can link to dropbox right from the application and keep your songs synchronized across a group of your devices or a group of different people, without sending anything around at all. Now consider that changing the key for a song chart requires only a single button push. Also that the presentation style of size/font/color, whether there are chord diagrams and where they are whether the chord names are embedded with the lyrics or above the line, ALL that kind of stuff is external to the file itself so can be set up differently by everyone in your group using the software to please themselves. None of that changes the files you are sharing so you share the same up-to-date songs and yet have yours prettified the way you like it. I have to work hard to find fault in this product. The main limitation I run up against is in sharing multiple song folders between different independent groups. It is tricky to set up dropbox sharing to keep it all straight. It is also tricky to maintain songs with identical names customized for different independent groups. Much of that seems due to limitations in mobile platforms: the desktop versions can easily switch between different “home” folders, all perhaps shared in different ways with dropbox, but the mobile platforms just have one dropbox home, period. It might be that improvements in Android and IOS and Dropbox could make it easy for the Songbook folks to fix all of this. My remaining issue has to do with the limitations of a song chart format vs a “Nashville” style chart. If you want to hand someone a chart to a song they are unfamiliar with and have them play along with you the first time, you need to show how many measures/beats between chord changes, because lyrics are just not enough of a clue. I find myself repeating chord names for each measure, even when the chord remains the same, to provide some clue on timing. It gets difficult when chords split measures. It would be great if there was some more general solution for a hybrid chart that could show where measures begin and end, an option to organize them in the ubiquitous groups of 4, maybe even show/hide the lyrics to focus on chord change timing, etc. App will not 'render' ... Takes perfectly good tabs and imports them as gobbly goop. Best tab sites are not supported. With the new version, 3.9.5, I'm having a issue with printing songs. Output will only print cords with a all black background, no text. Love the app except for this one issue. This app works great. It would be helpful to allow support for iCloud as well as dropbox. I use the workflow app to save a webpage off to my songbook folder in Dropbox. This makes it really easy to import. Great app. I really do love this app. It's not perfect but I still do love it. Song book reads text files containing songs in the chord pro format. For those who may not know, the cord pro format is a way to insert cords into lyrics and have a program display them above the lyrics. Just like a lead sheet. They also have apps for PC and Mac if I am not mistaken. Using the dropbox integration is a no-brainer. One can access the files from multiple devices. One can share their folder within drop box that contains their court profiles, with their friends and maintain a synchronized set of files. Editing files within the iPhone app, is OK for a quick touchup, but I wouldn't want to do anything major in there. I use the computer application for that. You can search for particular songs using the app and import them from popular websites. Very handy. Great ... if was clear how to add any songs. I have had this program for several days. I have a several times. One time I found a way to get a song with lyrics and chords, downloaded everything and more. I edited out all the extra garbage. When I came back to this program that song was gone, and once again I was left with only green sleeves, the sample. Searching for and downloading lyrics and chords could be much easier. For some reason this app requires a Dropbox account. I had a Dropbox account until iPhone synced every file and image to the account causing a huge headache. I purchased ChordPro Buddy to create comparable files but there is no way to get them into this app. If you don't have a DBox account you can type in the songs. You can get songs from the Internet but most I found only downloaded a PDF file. Other than that it has some pretty nice features. That is why it didn't get one star. The latest update is supposed to add support for "typesetting in Right-to-Left languages.“ When I tried to enter a song in Hebrew, I could not see a way to align the text to the right, nor could I figure out to how to place and use chords in English (A, B, Bb minor, etc.) in and among Hebrew text. Can LinkeSOFT please explain the situation? This app has great potential. But at this point it is really crap! iPad will not sync with Dropbox. Can not add songs through email. No one is going to type their music into the app. As an app developer I know these these issues are not that difficult to overcome. I have been using Songbook for several years to keep a bunch of songs at my fingertips. I used it on a music tour, putting all the songs we might play in one Songbook 'song' that allowed me to react to whatever song the leaders called for on a given night quickly. I also find it a great asset to share songs with my students. And suddenly, it has PDF support, so this adds access to my library of music in PDF format so essentially all my music is viewed in one app. I keep the files in Dropbox, and use the Mac application to do most of the editing. Highly recommended. Wonderful to be able to work on laptop, adding songs, editing them, organizing in folders and then (using Dropbox) have them available on my phone and iPad. Love the import feature that magically translates chords and lyrics into Chopra format. I love the concept and enjoyed using this on gigs for about a year. Then, suddenly I would go to the app and large numbers of tunes that I really rely on for my gig have simply disappeared! Totally unacceptable! I can't believe I cleaned out my paper files and now I must spend about 30+ hours putting my old book (binder) back together. This happened on iPad, and on iPhone, my list dumped 600 songs and left 2!!! Help function not helpful. I love this app! I use it for every service. It's synced to my iPhone via Dropbox. I can choose a set list before gigs with my phone and it's ready to go when I open my iPad. Priceless! The customization settings are Awesome! Why they changed how to select on edit? The only thing that really buggs me after the past and recent update is that when I edit a song, I used to grab the whole line or sentence or even a paragraph with two fingers like one in the begining and the other finger at the end at the same time and it would mark it so I could right away choose cut, copy, etc. Now is just like any copy/paste selection on iOS that I have to push to bring the cursor and the select/select all/paste buttons and then select and then move the curson marking all the words I want to edit (like copy a whole chorus to paste below) and then to choose what to do. Why whyyyyyy??? before it was just much faster and easier to select all the words I wanted at once, I used that a lot and saved me bunch of time now it just buggs me, please bring that feature back! Since the last update the Chordie website has gone crazy. Chordie will not work. My songs are still there but it won't let me import new songs and flip flops me all around the website. I tried to log in to the forum and it said password incorrect. So, I put in a new one, got in, went out, back in and it says password incorrect. Chordie needs to fix their site so I can use the app for new songs. I bought and tried several ChordPro-compatible apps for managing my lead sheets and I like SongBook the best by quite a wide margin. You can figure out how to use it in about 10 minutes without reading the manual. Syncing with Dropbox works perfectly (syncing is a really challenging thing to get right). It also has the three features I need most: the ability to transpose, the ability to indicate if you are using a capo, and compatibility with a foot pedal for scrolling (it works with AirTurn and PageFlip pedals with zero setup). OnSong is probably the leader in this category but I found it to be too difficult to use. It has a lot of features but if you need 36 videos to explain how to use your app (which OnSong has) that's just too much work for me. I also had problems with OnSong's basic functionality being buggy in places. The user manual disappeared on me, and I found out on their website this is a known issue. And songs often mysteriously had one key written in the metadata but displayed another even though transposing and capo were turned off. So in conclusion, I like SongBook's ease of use and lack of bugginess. And it does just about everything I need it to do. My one request would be that it store and display PDF sheet music...for now I just use another app for that. This is absolutely the best app I have ever used! All of my band mates and gig mates are now using it. God Bless the developer of this app! Thanks to the folks at Linke Soft for adding configurable scroll % in the last update. I am a pianist and don't use the Chord Pro format - all my charts and music are rendered as PDFs. I set the scroll to 50% for 1/2 pages, and now I can see across the page break while playing (using AirTurn Duo) ... a couple extra clicks of the pedal well worth it. I can now put all my music and charts in this app and hands-free turn pages or switch to next song in the playlist. This is a great app. I use this app almost every day, I have 506 songs on it and have it on various phones and iPads, I update and sync with Dropbox. It is amazingly easy to use and to maintain, I have Spanish songs, English songs, Jazz, compositions in progress, etc. I can get songs from the internet with chordpro format or can load them directly and configure to my taste and ability. I use guitar and ukelele chord banks. If you want to excel playing songs and have your library neatly organized, this is the app for you, I very highly recommend it, you’ll love it! I love this app. Been using it since version 1. Please update the Apple Watch support. First line of chords of a song, no lyrics, just one playlist. Whole song with chords and auto scroll would be nice. Then I’ll up my rating to 5 stars. Thanks.